Students in Cardiff were treated to a cup of tea today, in a bid to raise awareness of the estimated 6.3 million teabags put in the bin and potentially sent to landfill by students each year. 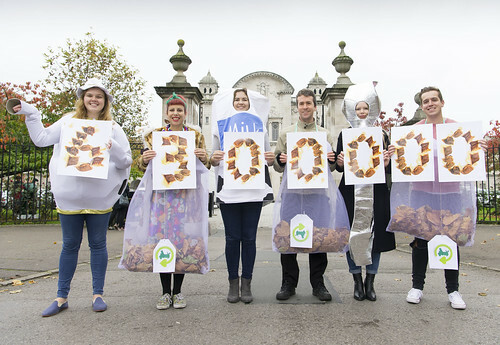 The Recycle for Wales campaign saw students donning teapot, teabags, milk and spoon costumes in front of Cardiff University and around Cathays Park – revealing the staggering number of teabags evading the food waste recycling bin. While the tea-suited ensemble paraded the university grounds, the Recycle for Wales crew spoke to tea drinking students about how to recycle the many varieties of tea we now drink. Wales currently ranks third in the world in recycling, according to new independent research, despite the fact that 24% of 18-24 year olds and 32% of 25-34 year olds don’t recycle their food waste. In contrast, their older counterparts are leading the way with food recycling with 87% of 65s and over, stating they do recycle their food waste. Additionally, a separate study of over 5,000 Rhondda Cynnon Taf residents carried out by Recycle for Wales revealed that students will need to rise to the challenge to meet the recycling standards of their counterparts not in education. Despite food recycling services being available, only 28% of students recycle their teabags compared to 67% of those not in education. The Welsh recycling campaign divulges that if all 95 tonnes of teabags binned by students in Wales each year were recycled, it could generate enough electricity to power a typical student house for over seven years. That’s enough to power a medical student’s home for the entirety of their degree. The recycled teabags could also play a huge part in student entertainment during their free time – in fact, if all the teabags destined for the bin and potentially ending up in landfill were recycled, it could power a DJ set constantly for over 15 months or a band playing in a small venue for 16 and a half months. Furthermore, around 153 million teabags end up in landfill from across Wales, which contributes to the creation of methane, a harmful greenhouse gas. In most parts of Wales, when teabags, and any other food waste, is recycled it is sent to an anaerobic digestion plant. Anaerobic digestion involves the natural breakdown of food into methane and carbon dioxide gas but instead of escaping into the atmosphere, these gases are used to generate electricity. This electricity can then be used to heat and power homes in the local community. It can also produce fertiliser which can be used in agriculture. Angela Spiteri, Campaign Manager at Recycle for Wales, said: "Everyone loves a good cuppa, especially students on breaks from their lectures. There are over 128,000 students studying in Wales and it would be fantastic if they all recycled their teabags after enjoying their cuppa. That’s why we’re delighted to partner with students across Wales and Handlebar Barista today, to help encourage students to put the unavoidable waste item in their food caddies. For further information about how teabags can power up student living, see below listicle. Tea powered coursework. 36 recycled tea bags could generate enough electricity to power a computer for one hour. Power this weekend’s party - One and a half recycled tea bags could generate enough electricity to power a disco ball for one hour. Your caffeine fix - Six recycled teabags could produce enough electricity to boil a kettle for another cuppa.